sweet wine – Would Bukowski Drink It? OK so I am traveling for work and I am stuck in San Antonio TX on a rather frigid night and did not want to venture very far for anything. It’s 34 out and in the last week I have been to Columbus Oh (where it was -4) and NJ where it was also quite cold. I ventured out to get some Thai, which in itself in downtown San Antonio meant quite a hike and my only option for wine that I came across was a discount liquor store. I walked in and the store’s shelves were more than half empty. The selection was non-existent and it was this or red moscato or pink sparkling wine. 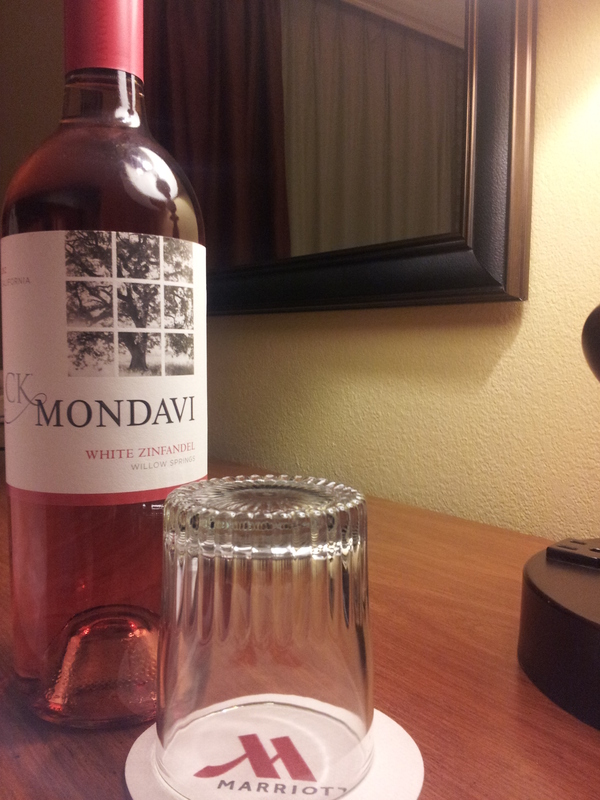 I at least have had Mondavi before, yes when I was 16 and took a chance. Out of the convenient twist off cap and into the hotel glass….The color is pink with a hint of rustiness that may just be a really old bottle, judging from the dust on it. The nose, amazingly is non-existent. Try as I might, I smell nothing but a slight berry soap smell. Sort of like the soap you’d expect in a teenage girl’s bathroom. Not even as good as something from Bath & Body Works or a Yankee Candle store. The taste…oh lord. Sugar, sweet and an ever so slight touch of berries. Memories of Bartle and Jaymes , Boones Farm, and again some strange soapy flavor. The wine has no finish. It is very acidic and not very balanced. Bottom line, if you are feeling nostalgic for the cheap wine you drank in high school, want a bad hangover, or feel like drinking wine that tastes like liquified Jolly Ranchers look no further. Would Bukowski drink it? Even I have standards Dave.